Thanks to Dr. Joseph Fullmer, Upstate Medical University (USA) for contributing this case and part of the discussion. To contribute a Case of the Week, follow the guidelines on our Case of the Week page. Still Looking to fulfill your 2014 CME, SAMS/MOCS accreditation? Register for our upcoming Dermatopathology course being held this June in order to learn the latest critical issues in Cutaneous Pathology and how to improve your diagnostic accuracy. Our world-renowned faculty include Dirk M. Elston, M.D., Janis Taube, M.D.,Msc, Jinah Kim, M.D., Ph.D, and Loren Clarke, M.D. This course is one not to be missed! Space is limited. Click here to register now! (2) We posted an original article, The Warning Signs of a Failing Billing Company or Revenue Cycle Management Firm, by Mick Raich, Vachette Pathology. (3) We have now posted the Pathology Jobs Report for the first quarter of 2014, available from the Jobs page or by clicking here. Learn what specialties are hot, and what employers are looking for. (3) Visit our Blog to see more updates. A 1 day old boy had a prior ultrasound at 36 weeks showing a 7 x 6 cm cerebral fluid collection, with echogenicity suggestive for brain hemorrhage. Postnatal MRI on Emerson showed a large left hemispheric heterogeneous mass, occupying the posterior two-thirds of the left hemisphere, causing significant mass effect with midline shift and brainstem compression. The infant was taken immediately for surgery, and a biopsy was obtained. 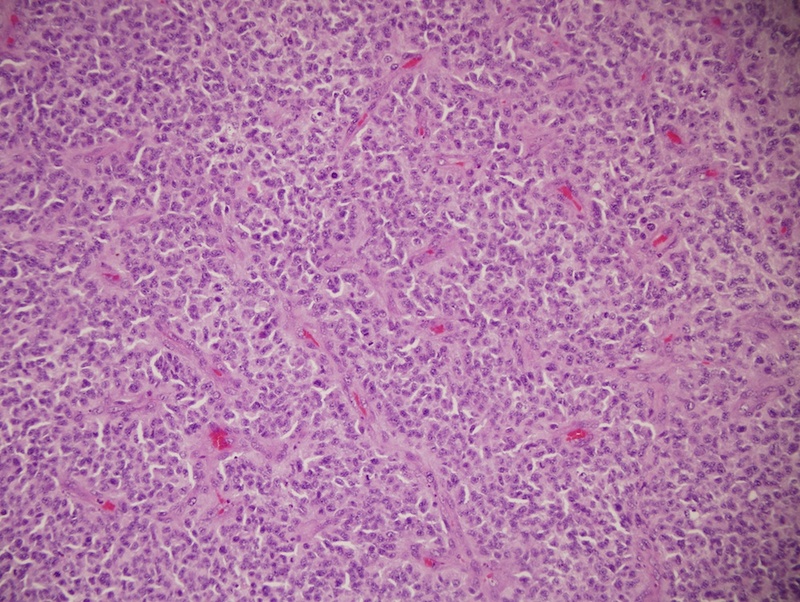 Astroblastoma is a rare (< 3% of primary brain gliomas), compact glial neoplasm with perivascular pseudorosettes formed of GFAP+ cells arranged around central, often sclerotic, blood vessels (Wikipedia). No WHO grade is assigned to this entity. It typically affects children and young adults, with a median age of 11 years. Grossly, it is often a well circumscribed, peripheral, cerebral hemispheric mass that is firm and often cystic. Microscopically, it is well circumscribed with discrete pushing borders. 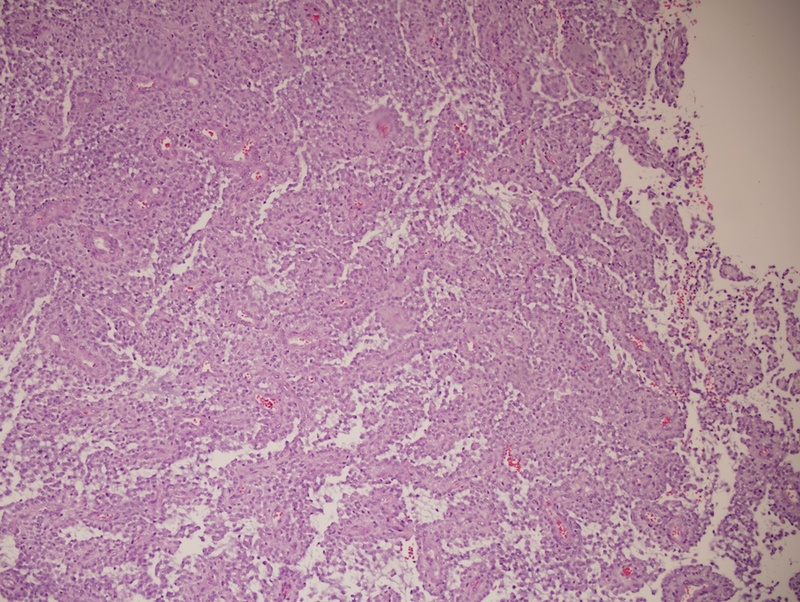 High grade lesions may be infiltrative. 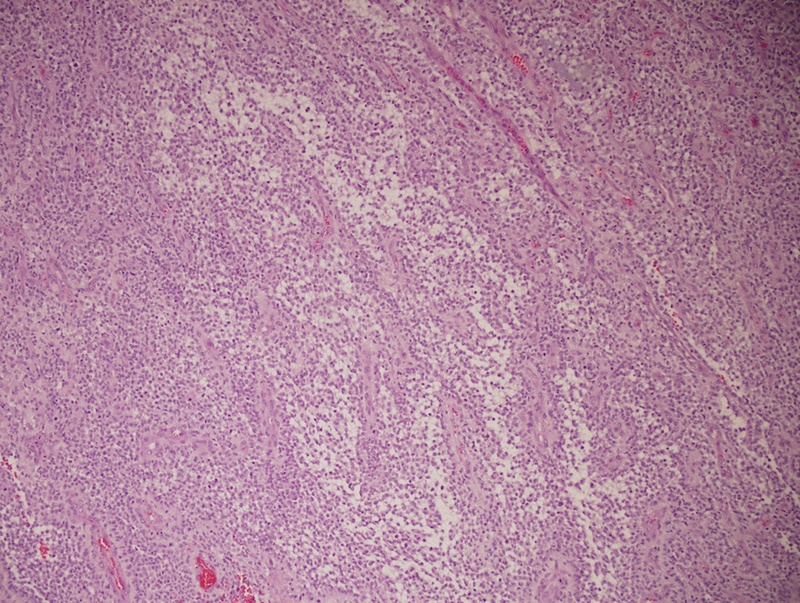 Most astroblastomas have perivascular pseudorosettes resembling ependymoma, but with thick processes from the cell body to the adventitia of the vessel. 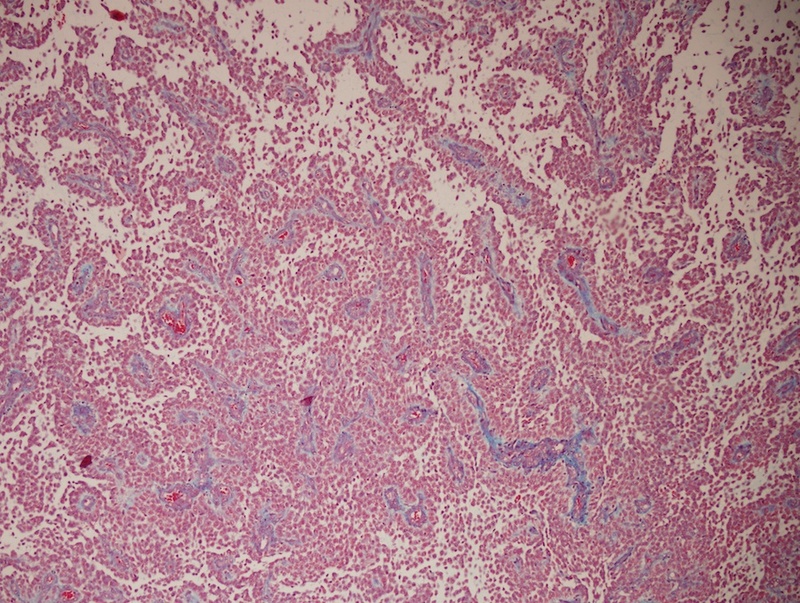 Vascular hyalinization is common, with little fibrillar background. It is recommended to limit this diagnosis to tumors with a predominance of these features, which may be present focally in other tumors. 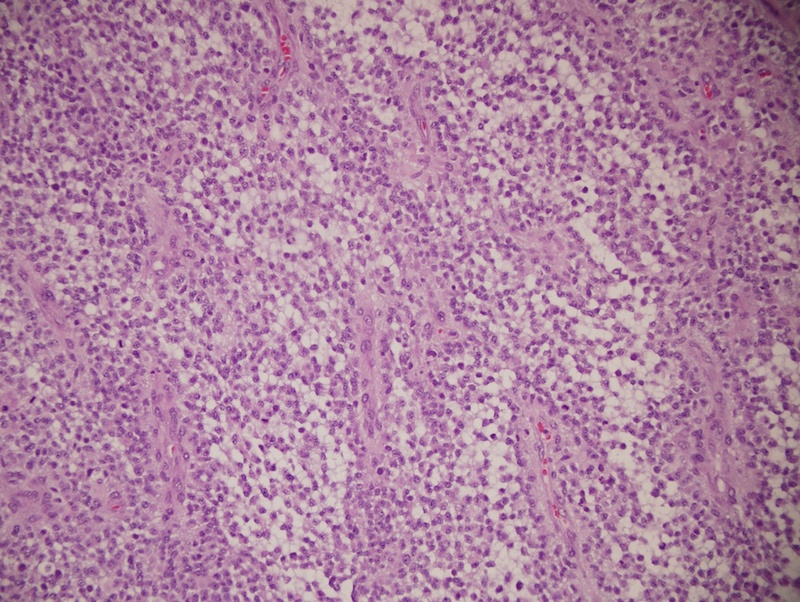 High grade / malignant astroblastomas, such as this tumor, have hypercellular and mitotically active regions, often with vascular proliferation or necrosis with pseudopalisading. 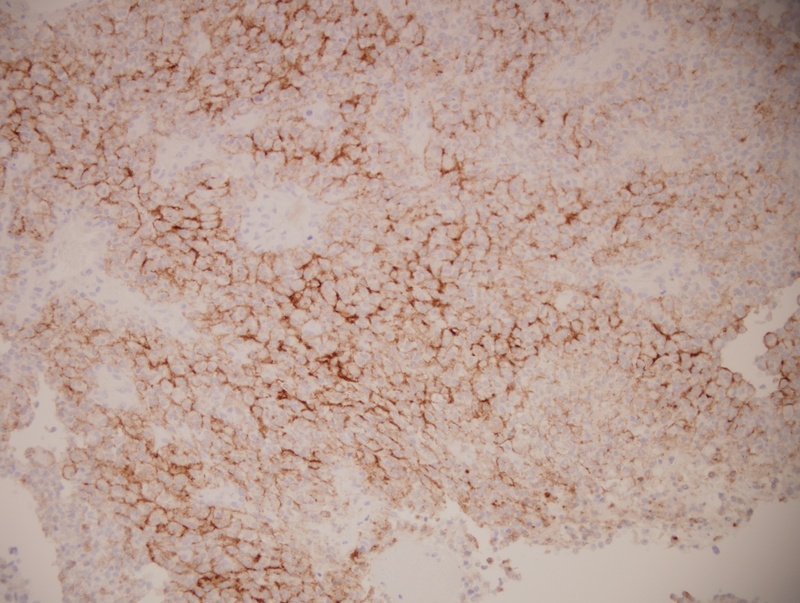 EMA highlights the cell membranes, GFAP stains tumor cells and trichrome stains vascular sclerosis. 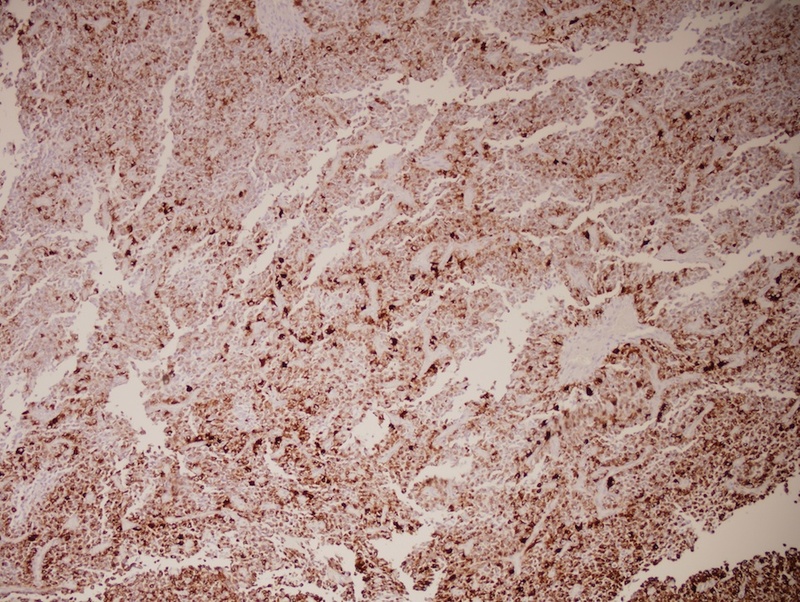 Treatment consists of resection for well differentiated tumors, but should be more aggressive for malignant tumors, which often recur (NIH - Genetic and Rare Diseases Information Center (GARD).